Keanu Reeves is a famous Hollywood actor. For many viewers, movies with Keanu in the main role have become synonymous with a non-trivial storyline and a good acting game. Reeves rarely plays emotional heroes, so the actor always needs a special talent to literally "play with his eyes" in order to make the audience feel the hero. Fans love Keanu Reeves not only for his acting and participation in cult films. In comparison with other scandalous celebrities, Reeves lives a quiet and calm, close to many of his fans way of life. There are famous photographs where the actor alone sits in the park, celebrating his birthday. Such photos got the name "Sad Keanu". The actor himself has nothing against such a nickname, once he even told journalists that he believes that it is not necessarily to be happy. Keanu Charles Reeves was born in Beirut on September 2, 1964. The family of the future celebrity had nothing to do with cinema. Reeves's father was a geologist, according to other sources, an unskilled laborer and drug addict. And his mother worked as a dresser in a nightclub and sometimes worked as a dancer. In addition to Keanu, three other daughters grew up in the family: Karina, Kim, and Emma. Keanu’s ancestors are of Portuguese, Irish, English and Chinese origin. The father of Keanu is from Hawaii. That is why he gave his son such an unusual name. Keanu’s name means "a cool wind over the mountains". When Reeves was two years old, the boy's parents broke up. Three years later the family, already without his father, moved to New York. The actor has never seen his father after that. Then Reeves's mother married the director Aaron Paul but in 1971 the couple divorced. After this event, the mother and children moved to Toronto, where the future actor spent his childhood. Their house was situated opposite the music studio, in which the famous Canadian musician Alice Cooper was recording his album. The rock star made friends with the boy, who often came to listen to his songs. Keanu Reeves was not very fond of studying, so he doesn’t like to recall his school days. As a child, a small Reeves and his sister Kim had dyslexia, which characterized by trouble with reading despite normal intelligence. Over time, the future actor recovered, leaving behind such irreversible consequences such as stiffness and lack of self-confidence. Even nowadays Reeves tries to overcome these character traits. Little Keanu learned to play chess early. The boy played this game very well. He managed to win adults, for which they gave him one dollar - that was his condition. As a teenager, Keanu Reeves dreamed of becoming a hockey player, because he played hockey very well. When he played hockey in school years, he got the nickname "wall", because the guy was an excellent goalkeeper, and he was recognized as the best player of the school, despite rather average height. In those years, in parallel with his studies, Reeves began working in the store as a seller of souvenirs. For five years he had to change four general schools, including the school of acting, from which Reeves was expelled. Then Keanu entered a Catholic school for boys, but he left the school in order to play hockey professionally. He also went to a free public school. And Reeves did not finish it and didn’t receive a diploma. Keanu Reeves began his acting career at the age of 15 years. In the local club, the guy participated in plays. The actor made his debut on television in 1979, when he starred in an advertising campaign for the Canadian television channel. Reeves did not plan to become an actor and considered advertising as a one-time way to earn. But little by little he became interested in this profession. Also, Keanu appeared in several short films in Toronto. In 1986 Reeves got his first role. The actor played a hockey goalkeeper in the film "Son of a Gun", after which the actor received a green card and went to Los Angeles. Thanks to his former stepfather, a producer Erwin Stoff became Reeves's agent. Cooperation was more than successful: Stoff remained the manager of the actor to this day. At the very beginning of his career, Keanu Reeves appeared as Norman Reeves or Chuck Spiden in the credits. His manager believed that the real name of the actor is extremely exotic. Reeves was invited to play the role of Private Chris in the film "Platoon". But since Reeves was negative about the scenes of violence, he had to refuse the role. For a long time, the actor starred in films for teenagers, and rarely in youth comedies and more in dramas such as "River's Edge" or "Permanent Record." Keanu Reeves also tried himself as a musician. Reeves played in the "folk-punk" group. The band released several albums and organized several tours around America, Europe and even traveled to Japan. Reeves was the author of such compositions as "Acid Room". Despite his participation in the punk band, Reeves remained a modest and shy guy. His colleagues in the group told that the guy said almost nothing during their concerts and only nodded in a friendly manner. When Keanu sang songs, then no one heard the words, as the musician stood far from the microphone. Later, Keanu Reeves joined the band “Becky”. Since 1990, Reeves was offered more roles in high-budget films. Already in 1991, Reeves appeared in the action movie "Point Break", then in "My Own Private Idaho." In 1994, Keanu played his first major role in the film "Speed", after which he was offered to play in its continuation, promising $11 million, but the actor refused to shoot in order to play a major role in a theatre play “Hamlet”. The young actor played the most difficult and desired role perfectly. Critics admired his playing the Danish prince and how he showed various shades of feelings of a desperate rebel. The blockbuster brought Reeves to the list of stars of the first magnitude. At that time, he began working in the film "The Devil's Advocate" along with Al Pacino. Reeves agreed to get a lower fee, just to give producers the opportunity to invite Al Pacino to the film. Since then, Keanu Reeves's filmography was filled only with quality works. Reeves chose not only blockbusters and main roles. Keanu also agreed to play episodic roles, if he believed that the picture would be of high quality. Keanu Reeves became popular in 1999 with the release of the cult film "the-matrix". In the past century, Neo became the most popular character. The film brought wealth to the film crew, and film critics used the term "Neo-realism" for all cases. Even the fact that Keanu, who played the role of the hacker Neo, did not have a computer, did not disappoint his fans. In 2003, leukemia of the actor’s sister worsened. She had this illness for 10 years. Keanu Reeves was forced to temporarily stop participating in the shooting of "the-matrix" and spent time with his sister. A few years later, the actor participated in the program "Stars against Cancer", where he told how his sister managed to cope with a serious illness. The actor kept silent that he donated more than $5 million to research programs against cancer and leukemia. Also, Reeves organized a fund against cancer. Reeves returned to work and in 2003 both sequels of "Matrix": "Reloaded" and "Revolutions" were released. Both films were incredibly successful and continued the line of the cult original. Critics favorably accepted the new "Matrix", although they noted the illogical plot and excessive desire for Hollywood gloss and a happy ending. That is why there appeared a "real" scenario of "The Matrix. The plot inconsistencies of the films were explained and corrected. The trilogy ending was a hopeless situation for mankind, and the Matrix itself remained undefeated, creating for people only the illusion of freedom and struggle. For participation in the "Matrix", Keanu Reeves received an incredible fee of more than $ 100 million. But most of the money the actor gave to costume designers and specialists in special effects. Keanu explained this by saying that these workers did as much for the film as he did, and they worked even more. In 2005, the actor was honored to receive a star on the Hollywood Walk of Fame. Before the release of the second part of the "Matrix", Keanu Reeves starred in few films, but they were not so successful. Among them: "Sweet November", "Hardball", "The Watcher". Films with Keanu did not always achieve commercial success or recognition of critics. 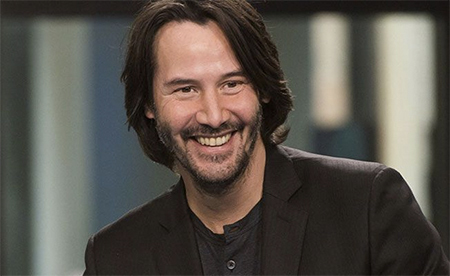 Then Reeves starred in the movie "Constantine", which returned the former popularity of Keanu. Subsequent works also received good reviews of critics and high box office fees. In 2006, Reeves starred in the fantasy film “A Scanner Darkly" and worked with Sandra Bullock in the film "The Lake House." In 2008, he starred in two films: "The Day the Earth Stood Still" and "Street Kings." In 2009, Keanu appeared in the "The Private Lives of Pippa Lee," which was shown at The Berlin International Film Festival. In 2013, Keanu Reeves decided to try himself as a director. In July 2013, there was a premiere of his debut film “Man of Tai Chi”. In the same year, the American-Japanese film "47 Ronin" was released, where Reeves played the main role. The film was an adaptation of an old Japanese legend about soldiers who, having lost their master, decided to avenge him at the cost of their lives. The film caused a big rush around the plot and the cast of actors for several reasons. Firstly, in order that Keanu, the actor with a completely non-Asian appearance, could play the main role, the plot of the legend had to be changed. These changes were historically inaccurate, and therefore raised questions in the sphere of nationality representation on the big screen. The second feature of the film had more positive reviews. The film "47 Ronin" shows a gloomy, non-Hollywood story. There is no happy ending for the main characters. Such a course of events has become, to some extent, a revelation for both viewers and critics. In 2014, the action movie "John Wick" with Reeves in the title role was released. Keanu played a simple citizen, who recently buried his wife and lives with a dog, the last gift of a beloved woman. But when a rich heir to the mafia kills this dog, the connection with the past, the hero shows his real face, a cruel and merciless killer. The film combines both dynamic battle scenes as well as deeply emotional dialogues, and a story about a man who has nothing to lose. After a loud success, there was a failure. The film “Exposed” did not collect 50 thousand dollars at the box office. The audience didn’t understand why Keanu Reeves, who all his life chose only good roles, got to this obviously weak film, which belongs to the beginning director and screenwriter. Reeves plays a policeman who, during an investigation, meets a girl who saw a mystical revelation. But the combination of mysticism and detective didn’t save the film and made it boring. In 2016, a new film with Reeves, "The Neon Demon," was released. With a simple plot - a young girl wants to become a supermodel - the film was successful. Before “The Neon Demon”, the idea of shooting a thriller and horrors about the "hard" life of models and celebrities seemed like a phantasmagoria. "The Neon demon" not only set a new tone for the stories about the beginning models but also got into the contest program of the Cannes festival. At the same time, news about the release of the second part of the story about John Wick appeared. Keanu Reeves has already demonstrated to his fans that he trains in martial arts and high-speed shooting. Most likely, "John Wick 2" will be a prequel to the already released film. Now Reeves plans to star in the film about anorexia, which will not only be the directorial debut of Marti Noxon but will belong to the genre of black comedy. Co-producer of the film will be Reeves’s sister Karina. This will be the first joint cinematographic work of the brother and sister. Another project Reeves will be the sci-fi thriller "Replicas." Keanu will play the main role, neurosurgeon, who in all possible ways tries to bring his family back to life. The shooting will take place in Puerto Rico. Despite his age, the actor is still unmarried; the personal life of Keanu Reeves is full of dramatic events and losses. The strongest love of the actor was Jennifer Syme - an American actress, with whom Reeves had long relations. With the girl, Keanu met through her sister in 1988, and then the young people fell in love at first sight. In 1999, Jennifer pleased her beloved with the news that they will have a child. The daughter of Keanu Reeves and Jennifer Syme was supposed to appear on January 8, 2000, but a week before the birth the girl's heart stopped beating. The child died because the blood clot broke away from the umbilical cord. However, there was not the only tragedy in the life of Reeves. On April 1, 2001, Jennifer Syme got into an accident. The car of the girl crashed into the parked cars, Syme flew through the windshield and instantly died from the injuries. After these events, Keanu could get over this for a long time and remained alone. The memory of the bride did not allow the actor to begin not only a long-term relationship but also a short romance. Years later, only in 2007, he had an affair with Hallie Meyers-Shyer, the daughter of famous screenwriters. Journalists began to talk about the wedding, but soon it became clear that Keanu began relations with a new girl Parker Posey. And later there was another girlfriend Trinny Woodall. In 2010, Keanu Reeves began to appear in public with the famous Charlize Theron, with whom he once starred in the films "Sweet November" and "The Devil's Advocate." Actors are friends since these shootings, and have repeatedly talked about their communication and that they are ready to help each other. But at that time the press spoke only of the friendly relations of the stars and there was no reason to suppose otherwise. Charlize Theron supported her friend after the death of his daughter, and then his wife. In 2010, Keanu and Charlize were seen in an expensive restaurant, and their embraces were not like the gestures of old friends. The press spread rumors that the actors were planning to live together in the UK. In 2013, the world's media started talking about the relations of the star with the Russian model Anna Skidanova. Their photos appeared after the weekend on the yacht. The girl tells that they have only friendly relationship. But despite her statements, journalists insist that they have romantic relations. In 2015, Keanu Reeves starred in a strange thriller "Knock Knock". The film had positive reviews from critics who could not understand whether the constant feeling of comedy and children's play was a genius idea of the director and actors, or all this was just a giant cinema failure. The film did not bring Reeves any professional awards, but he met the young actress Anne de Armas. But still, there is no confirmed information about their relations. Keanu Reeves has the status of the most secretive Hollywood actor. It is not known whether he has a girlfriend. At the same time, Reeves is hard to blame for avoiding society or excessive snobbery. He often uses the subway, despite the fact that he can afford to move in a more comfortable way. And in one of his birthdays, Keanu was seen in the park, putting a cupcake with a candle next to him, so that anyone who recognized the actor could come to him, congratulate him or talk.